What makes exercise habits stick? Since I’ve started running the Tone Every Zone challenge, I have a survey that participants fill out at the end to give feedback. Interestingly, what almost every single person has said – across the board – is that the program motivated them to jumpstart their exercise and get really, really consistent with their fitness habits. Considering that exercise can feel like a chore for many, I have been intrigued by this aspect of participants’ feedback. So what creates motivation? What makes exercise habits stick? What makes it approachable, fun, and – yes – easy? I have broken it down into five components that you can apply to your workouts right now, to make them easier to include in your everyday life. If you have a gym membership like I do, I’m not saying that you should work out at home exclusively. But you should make it at least possible that you could work out at home. When the Tone Every Zone challenge starts, participants have a week to gather the equipment for the workouts. I provide Amazon links and specific weight recommendations, and then all of the workouts can be done either at the gym or at home. In other words, it’s very important that you can follow through on your intentions. If you’ve got a busy lifestyle, restricting your workouts to the gym may be unrealistic – it may make it too difficult to follow through consistently… especially if you don’t like the gym, as Fogg would point out. While relaxed, 60+ minute workout sessions can be fun if you enjoy exercise, that time frame may be too rigorous for the average workday, resulting in lots of missed workouts. By shortening the timeline down to 20 minutes a day, many of the Tone Every Zone participants found that they could exercise far more frequently and consistently. Relax your standards for what you consider to be a “workout,” and you’ll find that you can get in a lot more volume over the course of a week. These small workouts do add up. One of my most successful remote coaching clients at the moment does four strength training sessions per week (only lasting about 30-45 minutes), but she also has an elliptical at home and she hops on as often as she can. Sometimes, these elliptical sessions are as short as 15 minutes. But by leveraging these tiny little exercise opportunities, she’s adding up hundreds of minutes per week total. My most successful participants in the Tone Every Zone challenge have what I call “When… Then” rules. “I just decided that when I get home from work, as soon as I enter the door, move the coffee table to the side and start the workout right away!” This is a quote from Amy, the winner of the Tone Every Zone Challenge (you can read her story here!). When Amy gets home from work, then she pushes her coffee table to the side to clear the living room floor – and then she works out! “My routine is to work out every morning before I go to work. 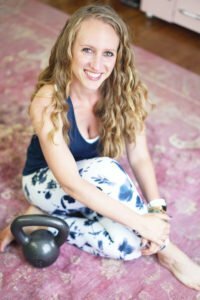 That doesn’t change when I travel on the road, unless I have to have a super early flight or drive.” This quote is from Kate, who completed the Tone Every Zone challenge last month (you can read her story here!). In other words, when Kate wakes up in the morning, she exercises! When it comes to building new habits, you can use the connectedness of behavior to your advantage. One of the best ways to build a new habit is to identify a current habit you already do each day and then stack your new behavior on top. This is called habit stacking… the reason habit stacking works so well is that your current habits are already built into your brain. You have patterns and behaviors that have been strengthened over years. By linking your new habits to a cycle that is already built into your brain, you make it more likely that you’ll stick to the new behavior. By creating “When… Then” rules, you ensure that you are “hooking” exercise to an already-established habit. This makes it easier to follow through. In other words, try to perform your exercise habits in a similar environment each time. This is where I see apps like ClassPass interfering with habit formation – by rewarding “class hopping” and preventing studio loyalty, users don’t have a chance to create a genuine routine. Whether you choose to work out at home, in the gym, on the track, or on the trail, it simply makes sense to be consistent and repetitive, so that your environment helps to elicit behaviors from you. To create a habit you need to repeat the behaviour in the same situation. It is important that something about the setting where you perform the behaviour is consistent so that it can cue the behaviour. If you choose a context cue, for example after lunch, we don’t think that it matters if you eat lunch at different times in the day. It can take much longer than many people think to form a habit and it is important to persevere… Over time it will start to happen more easily and require less effort. In other words, exercise habits can take time to solidify and begin to feel extremely rewarding and enjoyable. This important study revealed that it could take between 18 and 254 days to solidify a habit – the average length of time was about 66 days. This means that it could take more than two months to become comfortable with an exercise habit. The problem is that many people throw in the towel during the critical window after novelty rubs off but before exercise becomes more automatic, easy, and self-propagating. I have found that this often happens after about 4 weeks. From my perspective, I can see how if someone had pushed through just a little longer, it would have clicked. The practical implication that I have observed from the Tone Every Zone challenge is that it is important to break down bigger goals into short-term milestones that can be accomplished within 21-28 days. If you do this over and over, you’re ensuring that you get past that 66-day hump with a new mini-goal every few weeks or every month. The Tone Every Zone challenge, each cycle being only 28 days, allows participants to make progress within that time frame, and then switch up the workouts for a new cycle. The novelty introduces interest and variety, but keeps you moving forward to making exercise an automatic and easy part of your lifestyle. From my own training lifestyle, I find it interesting and fun to sign up for various races and to compete with myself for faster paces each time. Because the training cycles are relatively short, usually only 1-2 months, I experience powerful motivation to train. Consider the five tips above – which ones do you want to implement in your lifestyle?